At about 1.10am on the morning of 15 April 1912, lifeboat number 6 was launched from the port side of the RMS Titanic. 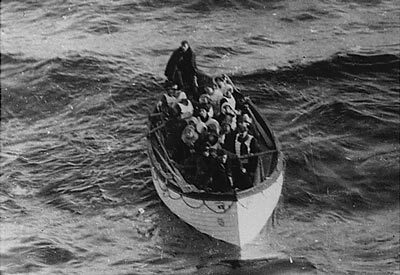 The passengers and crew escaping the beautiful, doomed ship included some of the most well known figures of the Titanic story. There was no less than the ‘unsinkable’ Molly Brown whose conflict with the nervous and volatile Quartermaster Robert Hitchins is well documented. Well documented too is Major Godfrey Peuchen’s abseil down to join Boat 6, being the only male passenger allowed into any boat by Second Officer Lightoller. He was sent to join crew members Hitchins and Lookout Frederick Fleet as he was an amateur sailor. As well as Hitchins, Fleet & Brown, Peuchen was joining a boat that also included Washington DC socialite Helen Churchill Candee and had a total complement of about twenty-eight in a capacity of sixty-five. Being the second boat to leave the port side, it is assumed many of the first class passengers on the boat had not yet realised the peril they were in. 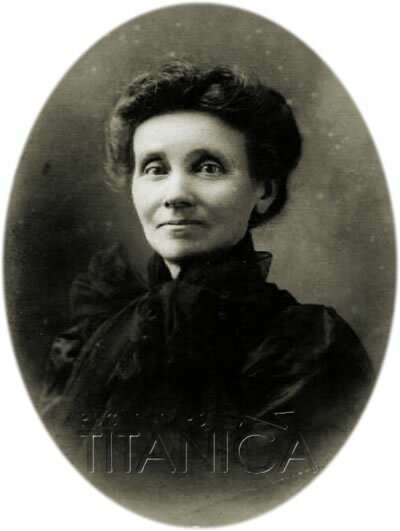 On the other hand, it is little known that also in lifeboat six was Marie-Eugenie Spencer, the French wife of New York born millionaire William Augustus Spencer and her maid, Elise Lurette. 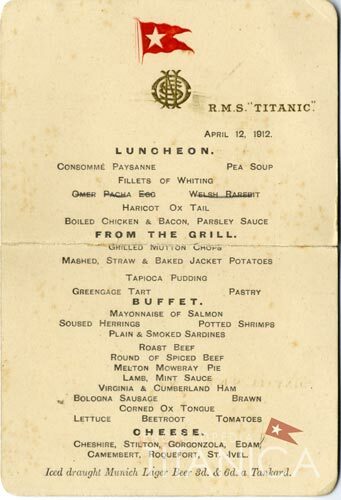 In Elise’s pockets were a plan of the Titanic’s first class accommodation, with the couple’s stateroom marked with a large cross and ‘Depart 10 Avril’ written on it and a lunch menu from a few days earlier. 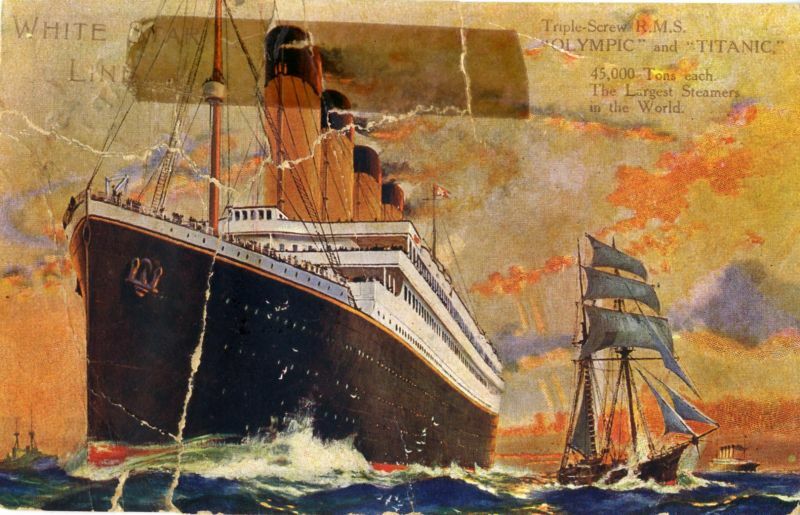 At Queenstown, she had sent a postcard complimenting the Titanic on her splendid luxury to her nephew in Switzerland. These items form lots 237 to 239 at Henry Aldridge & Son’s next auction in Devizes on 18 October 2014. William Augustus Spencer came from an illustrious American family. His family were direct descendants of a Virginia colonist and his Great Grandfather, Ambrose Spencer, had been a prominent politician in New York State; serving as Mayor of Albany, a state senator and, ultimately, as a member of Congress. They are believed to be distant relatives of the famous English Spencer family whose extended members included Winston Churchill and Princess Diana. William was born on Fifth Avenue in New York on 7 January 1855 to Lorillard and Sarah Johnson Griswold Spencer. No photographs of him are known to exist at this time of writing but a passport application describes him as 5 foot 11 and a half inches in height with brown eyes, broad forehead, regular nose, oval chin, grey hair, round face and a dark complexion. He had two brothers, Charles who was an artist living near him in Paris and Lorillard Jr who was a publisher who founded the Illustrated American in 1890 and decided to remain living in New York. He also had four sisters including one, Eleanora, who married into Italian Royalty and became Princess de Vicovaro Cenci. The family divided their time between New York, Paris and Switzerland, building a mansion at Lucerne called ‘Die Dreilinden’ which is now the city’s music conservatory. In about 1882, they employed Elise Lurette to work with them in Switzerland and Paris. It is possible that Elise was chosen as a servant for the family as she, like them, was a lover of books. Elise became a close confidante of Sarah Spencer and after Sarah’s death she went into semi-retirement and was not actively working for the family in 1912. She still remained in contact with William and Marie-Eugenie as they constituted the French/Swiss arm of the family after Charles’ death in 1906. On 14 March 1912, Lorillard Spencer Jr. died in New York City leaving behind an extensive estate in which his brother William was a named executor and trustee. Elise Lurette was named in Lorillard Jr.’s will as the recipient of a $200 a year pension for the services she had rendered to the family for so many years. It was therefore natural that Elise would be asked to accompany William and his wife to New York. An article appeared in the New York Times on 2 April concerning the vastness of Lorillard Jr’s estate which included a mansion house in Newport, Rhode Island and several properties in New York City. Lorillard Spencer Jr’s widow was to receive $100,000 in addition to a large and voluminous quantity of jewellery and personal effects. Amidst this enormous wealth could also be found a generous characteristic: $100 per year was to be paid to each of the deceased man’s servants for each year of continuous service. 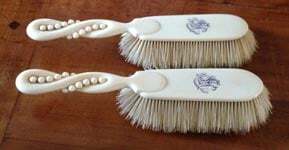 The Spencers had always been generous people with Lorillard Sr. and Sarah Spencer regularly leaving out expensive items that they regarded as surplus so that their servants, including Elise, could help themselves to. It would have been with a sense of urgency that the Spencers would have booked their first class passage to New York and could not have envisaged that the voyage they took on the new and much talked about Titanic would be so fateful. They booked ticket number PC 17569 via the White Star Line’s London office costing £146 10s 5d, a sum which would have a spending power of approximately £15,000 or $25,000 in 2014. What is known about the Spencer’s experience of the voyage can be gathered from Elise Lurette’s items that are due for auction in Devizes on 18 October. As they boarded at Cherbourg, it can be inferred that the Spencer party were kept waiting aboard the Nomadic as they waited for the Titanic’s late arrival following her near-disastrous encounter with the liner ‘New York’ as she sailed out of Southampton. Aboard the Nomadic, they would have first encountered Molly Brown, the Duff-Gordons, the Harpers and the Ryersons. Film star Dorothy Gibson was also passing the time on the little tender with her father. Benjamin Guggenheim, also held up on the Nomadic, would become their near neighbour in the port-side B Deck corridor once they were aboard. B Deck is often renowned for being the most luxurious area of the ship, with the most expensive accommodation located here. 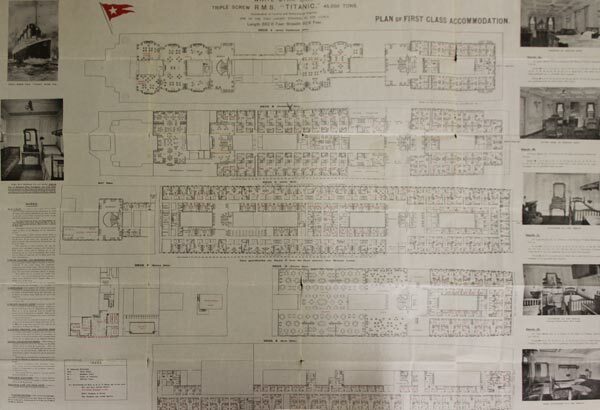 The Private Promenade suites were the first on any ship to offer private balconies. 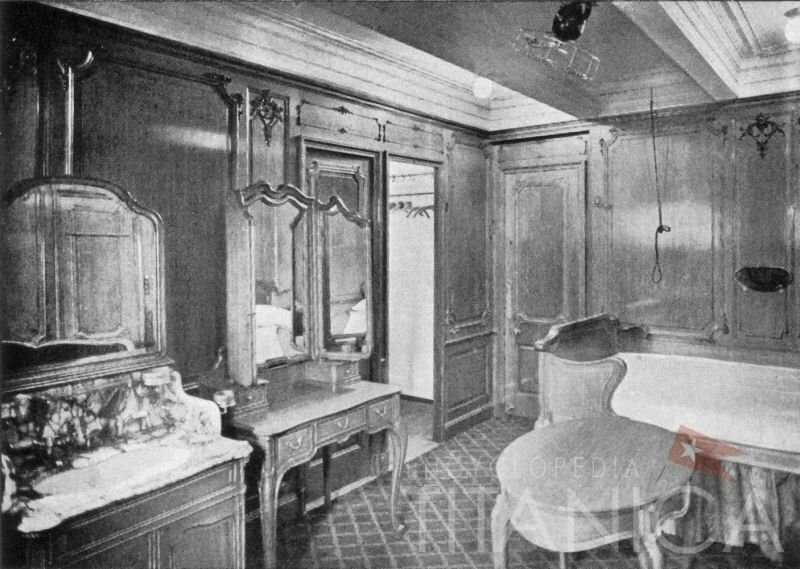 Further aft was a series of opulent suites, decorated in a variety of period and modern styles, with adjoining bathrooms and nearby small cabins for servants. The Spencers were allocated B-76 which was decorated in a lovely simple interpretation of the Louis XV style. The room also offered a wardrobe room and access to private bath facilities and provided a comfortable temporary sea-going home. Elise occupied the smaller adjoining stateroom B-80 ‘for one’s personal servant’ as Walter Lord described it. On the Friday, the Spencer party would have gone to lunch. As Elise was at that time no longer formally a full time employed servant of the family, it is possible that she would have dined with William and Marie-Eugenie in the First Class Dining Saloon and not in the Maids and Valet’s saloon on C Deck. It was also probably at this time she acquired the menu she had in her coat pocket when she left on Boat 6 three nights later. On the menu she has scored out the third line of options, Omer Pacha Egg and Welsh Rarebit. Possible reasons for this could be that they had been withdrawn from the menu by the galley staff or because Mrs Spencer did not want to eat them. She folded the menu in half and put it in her coat pocket after lunch. Although the weather has been reported by several sources to have been fine throughout the Titanic’s journey from Queenstown until the cold night of 14 April, it has been suggested the ship passed through a cold front on the afternoon of 12 April which would possibly explain why Elise was wearing the same warm coat at lunchtime that day she chose to wear when she ascended to the boat deck three nights later. According to her family members, Elise Lurette was as disbelieving as many of the Titanic’s passengers who were present during the sinking. She pulled her coat on over her night dress and went to the boat deck with Marie-Eugenie Spencer where they went to the Port side forward and got into Boat 6. Once on the water, Elise recalled seeing people jumping and quickly freezing to death and hearing screams in the darkness. She further recalled after the ship disappeared survivors in the water were not taken aboard for fear of the boat being swamped. It is possible she was recalling the attitude taken by Robert Hitchins who was ostensibly in charge of boat and was stubbornly reluctant in returning to pick up survivors. “Mr Wolcott Lane 80 Broadway New York City. Elise’s Marconigram tragically turned out to be correct: William Augustus Spencer died on the Titanic. In the weeks that followed, Elise travelled to Halifax to await the return of the MacKay Bennett from its grim excursions recovering the bodies of the Titanic’s victims but William’s remains never materialised. He is nonetheless had a memorial service in Chantry Grace Church New York on 10 May and he is commemorated on a Spencer family tombstone in Green-Wood cemetery in Brooklyn. William’s death coming a month after the death of his brother led to a complex probate situation for the Spencer family. The codicil by which he had amended his own will following the death of his brother had gone down with him on the ship. It took several months before a copy he had lodged with his Paris lawyers before departure was accepted as his clear intention. His intention for his personal wealth after his death has been enduring and has made its mark on a world renowned institution in New York City: the New York Public Library. While his total estate was valued at $2,208,650 (over $50 million in 2014), the majority of which was made up of several properties in Manhattan and the Bronx and stocks and bonds, the remarkable book collection William had built up in Paris was to be left for the benefit of New York’s reading public. The collection was valued at $40,799 (almost $1,000,000 today) and included works by Dumas, Tennyson, Victor Hugo and Voltaire. A room is still named after William Spencer in the building that he visited in 1910 and was so impressed by that he decided to bequeath not only his collection but additionally, over $300,000 in cash to the new learned institution. The beautiful books that make up the Spencer collection can still be accessed in New York by arrangement with the staff at Library. A post-script occurred in 1922 when William’s nephew Lorillard Spencer III married Katherine Emmons Force, sister of the famous Titanic survivor and teenage bride of the richest man on the ship, Madeleine Astor. Newspaper reports from the time of the marriage noted that both bride and groom were related to prominent people who had sailed on the Titanic. 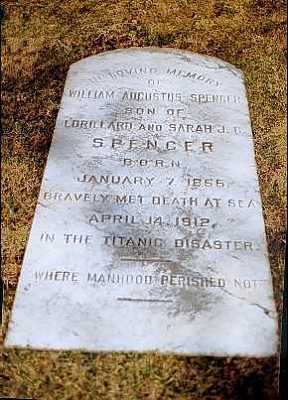 Although she survived the great disaster that was the sinking of the Titanic, Marie Eugenie Spencer died on 26 October 1913 in Paris. She was the second adult survivor of the Titanic to die after Colonel Archibald Gracie IV in December 1912. She had been in poor health before the voyage on the Titanic and it is believed that she was suffering from manic depression and a morphine addiction. Her poor health would possibly account for the low social profile the couple adopted during the voyage, likely staying in their stateroom most of the time and not socialising in the public rooms. It is probable too that the trauma of the sinking contributed further to her deteriorating health just as it had to Gracie. She was only 46 when she died and had not come from the privileged background that William Spencer came from. Her maiden name was Adnot and her father was reputedly a French boiler maker who had fathered her out of wedlock. As such, the union had not been approved of by the wider Spencer family and their wedding in October 1884 had to take place in London with no members of William’s family acting as witnesses. Marriage into the American Spencer family brought her considerable wealth. 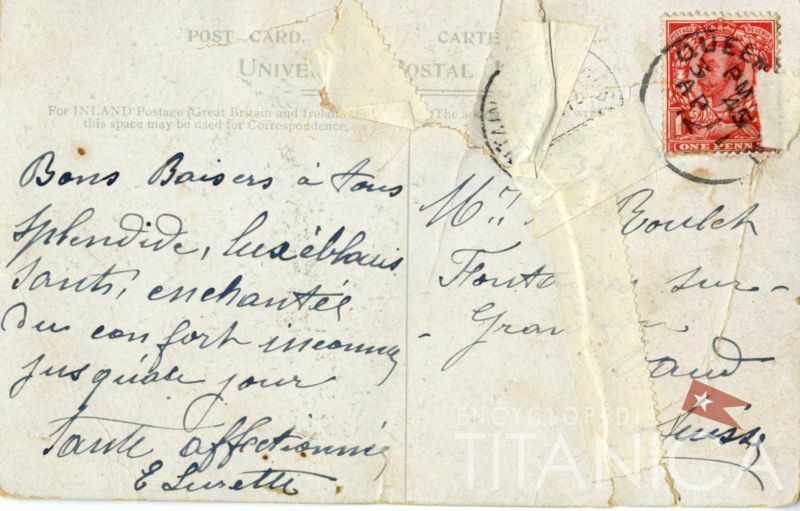 The insurance claim she made for her lost belongings on the Titanic ran to 75 items mainly consisting of several pieces of expensive clothing and was valued at 20,329.50 old French Francs; equivalent to about £53,000 or $86,000 now. While she died rich, the evidence points to her spending the last few months of her life as a widow living in near isolation. Elise Lurette nonetheless remained characteristically loyal to her and stayed with her in Paris until her death. Elise did not maintain regular contact with the Spencer family after Mrs Spencer’s death but kept up her long established habit of dividing her time between Paris and Switzerland. She was born the youngest of three sisters in 1852 in Hermonville in the Champagne area of France. Her sister Eulalie had married a Swiss gentleman in Fontaines and she spent the summer months with them until her death in 1940. Although she was short and thin in stature a with soft, high pitched French accent, she had a spirited and colourful personality which left an indelible mark on her family and she was and still is talked about generations later. She was referred to as “the Paris Aunt” by the Swiss branch of her family and her anecdotes of being a servant to a rich and illustrious American family residing in Paris lightened many an evening. Some of the items her employers generously gifted their servants are still in Elise’s family. 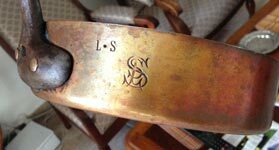 They consist of silverware and other items bearing the Spencer family monogram. In 1912, the Spencers were every bit members of a Gilded Age social class as the Astors, the Cardezas, the Strausses or any of the other famous families that have contributed to the legend that is the story of the RMS Titanic. Hopefully with the sale of the items salvaged and kept by their loyal maid, Elise Lurette, more discoveries about them will now be possible.